The word is finally out that we should avoid bisphenol-A (BPA). Warnings about the problems it poses, especially in children, have been cropping up since the 1980s. The FDA now finally reports that there is evidence of the potential negative effects of BPA on the brain, behavior, and prostate gland in fetuses, infants, and young children. The FDA now agrees that it may be wise to avoid BPA in baby bottles, sippy cups, and the linings of infant formulas and other food cans. Others find the data on BPA quite a bit more ominous: “Bisphenol A (BPA) has been associated with increased risk for cardiovascular disease, miscarriages, breast and prostate cancer, reproductive dysfunction, metabolic dysfunction and diabetes, and neurological and behavioral disorders.” As we discuss in class, one big problem with BPA is that it is a xenoestrogenic endocrine disruptor. Manufacturers now offer BPA-free food cans. 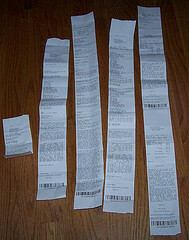 Many stores are now using BPA-free cash register receipts. That sounds great. Unfortunately, the reality is not so reassuring. Many manufacturers have simply replaced BPA with a chemical relative. For instance, your BPA-free can or cash register receipt may now instead be covered with bisphenol-S (BPS). BPS is also a xenoestrogen although it is somewhat weaker than BPA. The FDA is investigating some 17 different types of BPA-free cash register receipts but cannot yet assure us that any of them are safe or better than BPA. And good luck finding out what actually is on your receipts or in your food cans. Some manufacturers decline to tell us what they are using. The Washington Post reports: “Heinz, for instance, says it has switched to BPA-free cans for some products but will not identify them or say what substitute it is using. General Mills, which owns the Progresso and Muir Glen lines of canned products, said it is testing BPA-free cans but would not elaborate.” Even the FDA does not know which companies use BPA or BPS, how much they use, or how it is applied, because this information is proprietary. A few manufacturers are willing to talk about their choices. Eden Foods for instance uses a can lined with a mixture of oil and plant resins (such as pine) in many of its cans. These linings cannot, however, be used for acidic foods such as tomatoes. That is why trace amounts of BPA (one part per billion) were detected in Eden Foods’ baked beans. The beans were made with tomato puree that came in a can lined with BPA. Coming up with safe alternatives to BPA linings is a slow process. Testing must show that the new lining will hold up for the 2-5 year shelf life of most canned goods. Some alternatives disintegrate more quickly, shortening that shelf life. Other linings break down at the temperatures used in canning foods. Still others interfere with taste. So what should you do? Your best bet is to look for inert materials: Glass bottles and jars. Replace canned goods with fresh and frozen foods. Be more selective about accepting cash register receipts and wash your hands after handling them. And do not expect miracles and remember: Just because the label says “BPA free” does not guarantee that the product is free from strange chemicals. This entry was posted in chemicals, Food and tagged bisphenol, BPA, BPS, canned goods, cans, glass, receipts, xenoestrogen. Bookmark the permalink. 4 Responses to What is BPA-free exactly? I wondered about my, beautifull green BPA free water bottle I purchased at, Mt. Equipment Co-op. in Vancouver BC . I wrote to some can food producers about their can liners, no one ever got back to me! go figure! After taking your class I became increasingly fanatic about trying to avoid BPA and its sinister relatives. Easier said than done, given how ubiquitous these endocrine-disrupting chemicals are in our day to day environment. For example, one study (link below) done by the Washington Toxics Coalition found 95% of the dollar bills they tested were positive for BPA. Additionally alarming they found that just 10 seconds of handling BPA contaminated receipts transferred up to 2.5 micrograms! The assumption being that our money, our fingers, and goodness knows what else have become invisible contaminants.